This site suggests effective ways to overcome prostate cancer and its treatment side effects, but the author, Rabbi Ed Weinsberg, does not purport to give medical advice. 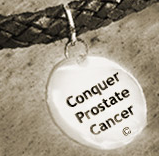 Physicians cited on this site and in the book Conquer Prostate Cancer, including contributing author, Dr. Robert Carey, and medical advisor, Dr. David Kauder, are quoted only for educational purposes. Before making any medical decisions, you should see your doctor or another qualified medical professional.